During my 'blind tasting' (or, rather, the Dining in the Dark event at The Living Room in Oxford), I happened upon a revelation. I gingerly pushed a spoon of something crispy but soft in the centre into my mouth. A croquette? Mashed potato, definitely. And cheese. But, as I slipped off my blindfold, I was assured that there were no mashed potatoes at all in there, just breadcrumbs, Caerphilly cheese, leeks and seasonings. They were Glamorgan vegetarian sausages. And right then, I decided I would track down the recipe and make them at home. But they're mighty tasty, if you can keep an eye on the pan while cooking them. I based the recipe on Sophie Grigson's Glamorgan sausages but changed a few ingredients and quantities here and there. I've used rice crumbs for the coating, so they're lighter - you still have the breadcrumbs on the inside, but the rice crumbs give a crispness for the outside. They're cheesy, surprisingly light, and I've started craving them with baked beans and a few chips, but they'd also be good with a dressed green salad and a dollop of chutney. In a bowl, mix together the Caerphilly, breadcrumbs and the leek. In a separate bowl, whisk the eggs and beat in the parsley, mustard and season well with salt and pepper. Tip about 2-3 tablespoons of the mustardy egg mixture into a small bowl and the rest into the cheese and leek mixture. Give it a good stir, so it becomes sticky and well combined. 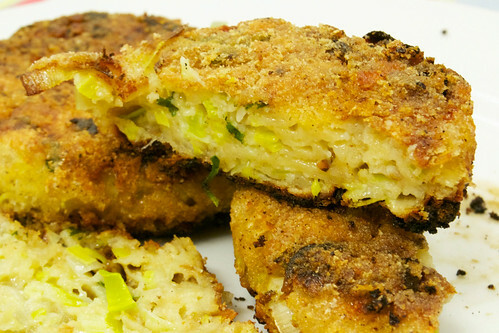 Tip out the rice crumbs onto a plate and then form the cheese mixture into four patties. Dip them in the egg and then into the rice crumbs. Fry in a little oil for about 5 minutes on each side, turning them over once golden, until they're piping hot all the way through. and these use two of my favourite ingredients cheese and leeks. Thanks Maggie! Yes they were lovely, hopefully will get to make them again soon. I've heard of glamorgan sausages but never eaten them. These look very tempting, my son would love them. Thanks Sarah, yes the girls loved them - I'll try and keep an eye on the pan a bit better next time, though! :) Definitely making them again, they would be lovely in the summer with a dressed green salad.